iPads vs Textbooks. Which is more expensive for schools? Do Kids Really Need Homework? Here is a good article on how to create an environment that is set it and forget it. You can save a ton of tech work orders by using Deep Freeze from Faronics and now you can make it even better as Dell has team up with Faronics to create an even better solution to work station management. Research on how sound enhancement sound systems can help with student learning. 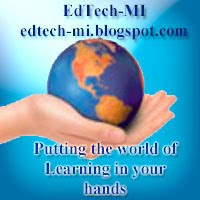 Here is a youtube video on what project based learning might look like. Digging into the reality of community broadband - we compare the broadband prices and speeds of community networks to incumbent providers, using examples from North Carolina that are representative of modern community fiber networks. Incumbent providers including AT&T, Comcast, and Time Warner Cable want to outlaw these networks even as many, including the Federal Communications Commission, recognize the clear benefits of allowing communities to decide locally whether such an investment makes sense. This is a few years old, it was created in 2009 but it gives you the idea of were we are going. A brief overview of how to use the iPad for visual recording/notetaking. Includes things to consider when doing this; how this is different from traditional (paper-based) visual recording; and comparisons of four tools (Ideas, AirSketch, Brushes, and SketchbookPro). How IPads can fit in to a Kindergarten classroom. New iPad App to manage your entire vSphere environment. So 'soon' you can use your iPad besides your win32 vSphere client to manage your servers, including possible features like vmotion and SRM interaction. How cool is that!! Campbell Union School District (Campbell USD), located in the heart of Silicon Valley, needed to find and acquire a budget-friendly Wi-Fi solution with a viable long-term total cost of ownership. With a small staff and only a few weeks to deploy, the installation and configuration needed to be fast and simple. The result - Campbell USD deployed 50% less Ruckus Wi-Fi product than what was recommended by the competitors. The changing role of all of us in education from the school to the family. How do you represent the evidence of students' learning in the differentiated classroom? Rick Wormeli, author of Fair Isn't Always Equal and Differentiation: From Planning to Practice, offers his advice on how revisit your current methods and to incorporate standards-based grading. Grant Wiggins describes how encouraging feedback from his students helped him to become a better teacher.